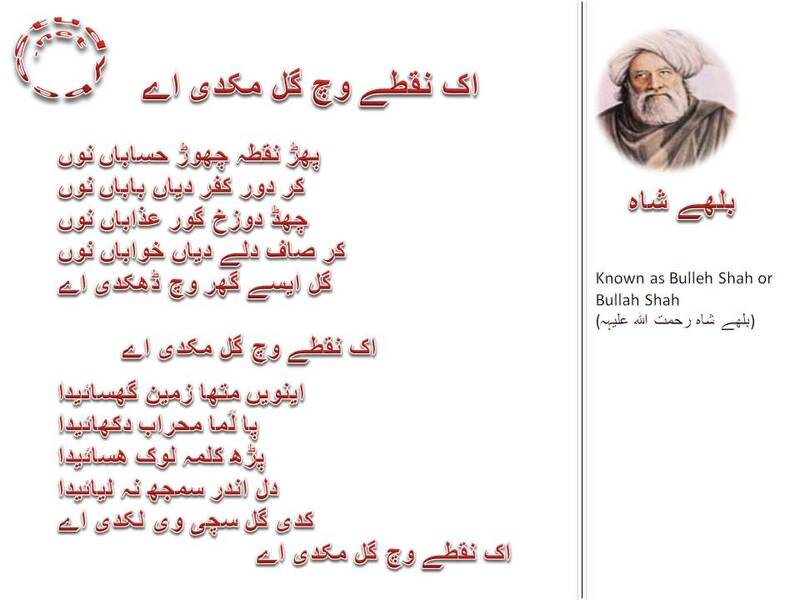 ‘Ik nuktay wich gal mukdi aye’ is a wisdom rich poem for the ones searching for God Almighty; Bulleh Shah unleashes the righteous path by concentrating all his thinking powers and beliefs on this single thought i.e. one needs to look into the pure heart of oneself. The purer the heart, the clearer the path to virtue; the virtuous we are, the better beings we are in the eyes of God Almighty. God loves purity and nobility of heart. So, Bullah wants us to attain that stature of goodness which helps stand out in the multitudes of this world. He advises us to forget the pains of grave and the fears of hell. Just think not either about good or bad dreams we have. For a moment, do away with the long prayers and the ‘mehrab’, a sign of scratching the forehead on the ground; instead focus on that one point i.e. purify your heart. It will ensure your salvation. Without purity and cleanliness of heart and emotions, we would not find God.